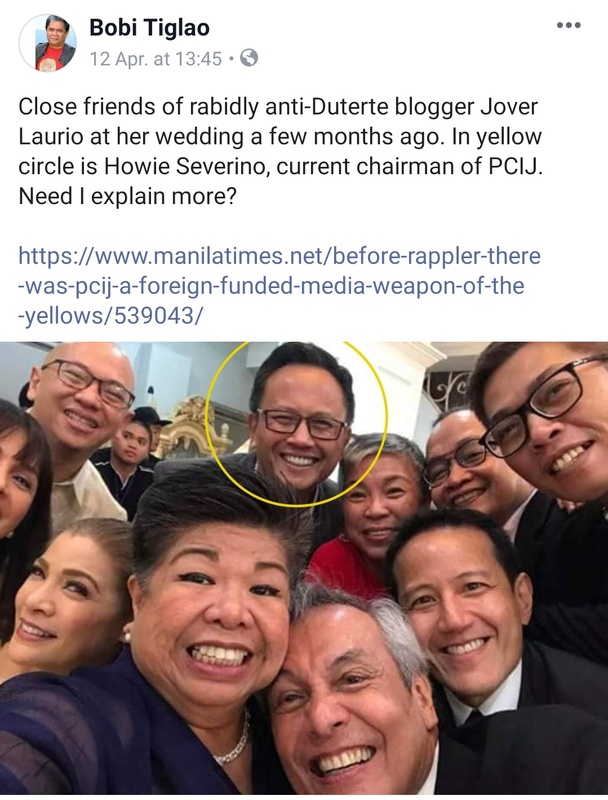 How can one expect Filipinos to regard the chi chi Philippine Center for Investigative Journalism (PCIJ) as an objective source of information when its chairman, Howie Severino is a known rabid supporter of partisan camps loyal to the Aquino-Cojuangco clan (a.k.a. the Yellowtards)? In the company of known communists, Yellowtard politicians like Florin “Pilo” Hilbay, and disgraced singer Jim Paredes, among others, it is difficult to see Severino and the PCIJ as anything other than just another mouthpiece of groups loyal to failed ideologies and narratives. PCIJ, Vera Files, CMFR have been demanding transparency from government. Yet they refuse to be transparent when they’re asked who are their funders. Don’t they know that media like government is a public trust? They haven’t responded at all to my queries. It must be clear in hindsight to many of the bozos in this photo what a dumb idea it was to be caught all together in this now iconic wedding photo.